Counting to 20 is a big step. Kids know they’ve mastered the big “10” and they get to move on to this new challenge. You feel good, too, because it a milestone achieved and a skill mastered. It feels good to mark “counting to 10” off on the assessments and keep moving your kids along in learning and growing in their counting skills. 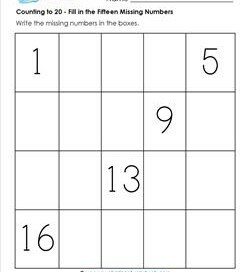 In these worksheets kids trace the numbers, write the missing numbers on the lines, or fill in the missing numbers in the boxes. 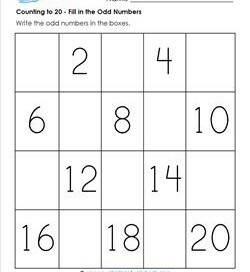 Kids can practice counting to 20 with this counting worksheet. All they need to do is say the numbers in order and trace the even numbers. Count one number at a time! Say them nice and loud! Which ones do you trace? Even or odd? Only the odd ones. 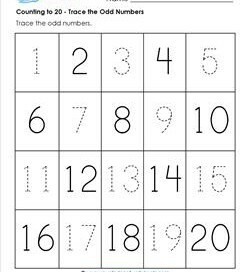 Great for identifying and writing odd numbers. 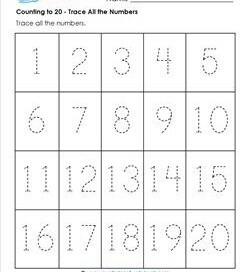 This is a great worksheet for kids who like to trace numbers but may not yet have the capacity to trace all of them within a certain amount of time. Need a little something to fill a few minutes of time? Have some kids who need more practice counting to 20, or writing to 20? This is the worksheet for you! 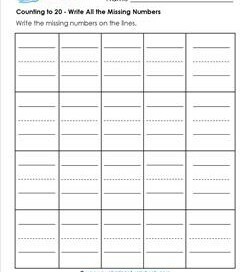 You can use this counting worksheet to get kids to recognize even numbers (the ones they write) and odd numbers (the numbers already on the page). Want practice counting by 2’s? Well here you go! But also, you can count by 1’s to 20 and write odd numbers neatly on the lines. This is just way too cool! 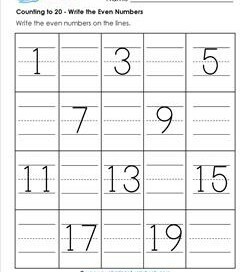 Kids get to practice writing fifteen of the numbers between 1 and 20 on the lines with a bit of guidance with the five numbers that are provided. 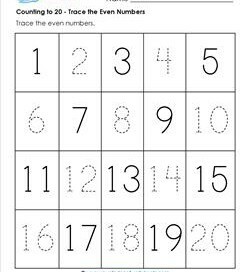 This counting to 20 worksheet would be awesome to use for assessments on several levels – improvement in counting to 20 and number writing skills. 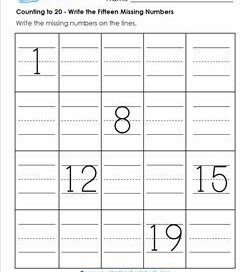 Kids can count to 20 and fill in the missing even numbers writing carefully. The large boxed spaces give plenty of room for neat or not so neat writing. 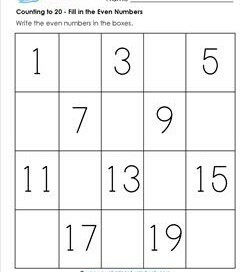 You can throw some dice and say if the numbers are even or odd, or … you can use this counting to 20 worksheet to identify evens & odds up to 20. This worksheet has five numbers with spaces in between. Kids use the numbers as reminders for where they are in the counting sequence. In this worksheet kids don’t have to write neatly on lines or trace the numbers. They just get to count to 20 and write the numbers to their best ability.